Chocolate. It’s one of the things that makes the world go around, isn’t it? Well, along with money and, in my world, coffee! For many people, the more chocolate, the better. 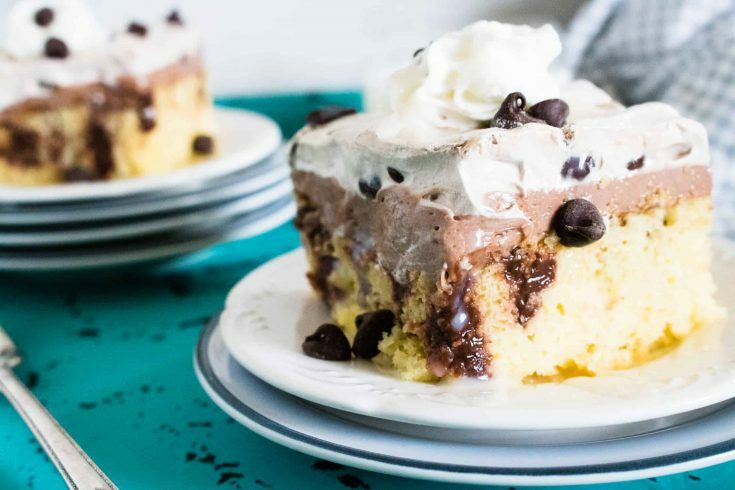 This amazing recipe for Quadruple Chocolate Poke Cake delivers on that wish with a rich chocolate filling, silky chocolate cream cheese frosting, fluffy chocolate-infused whipped topping and a flourish of chocolate chips! Yep, that is four chocolate sensations in one delicious, wonderful dessert! This chocolate poke cake is definitely a chocolate lover’s delight. 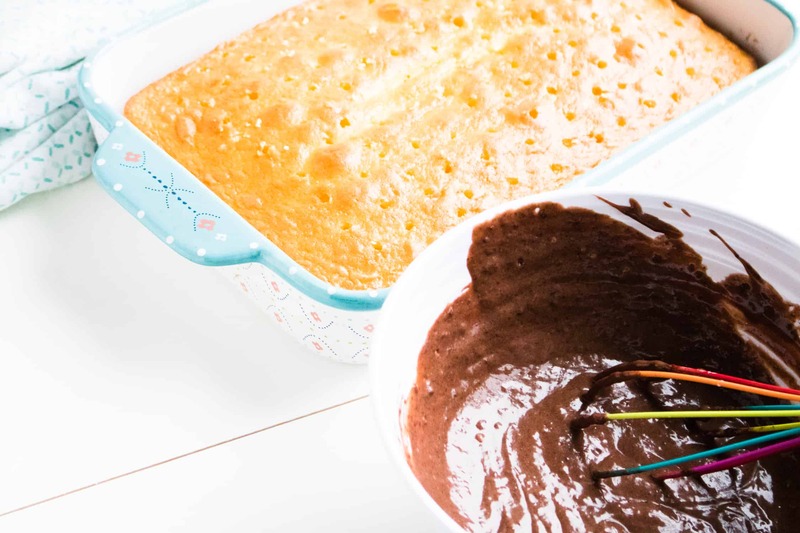 This recipe uses a simple and quick boxed cake mix, which means no measuring flour, sugar, etc. 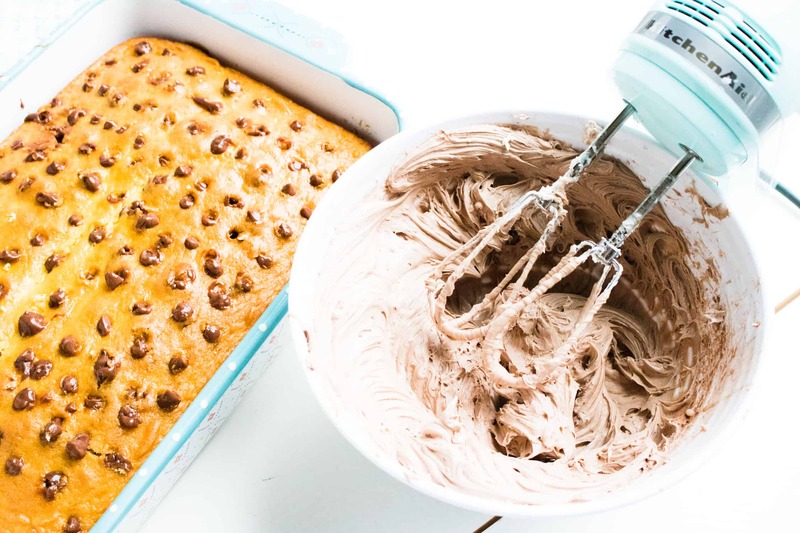 Add just a few ingredients to the boxed mix, stir and bake and you have your cake is ready to go! 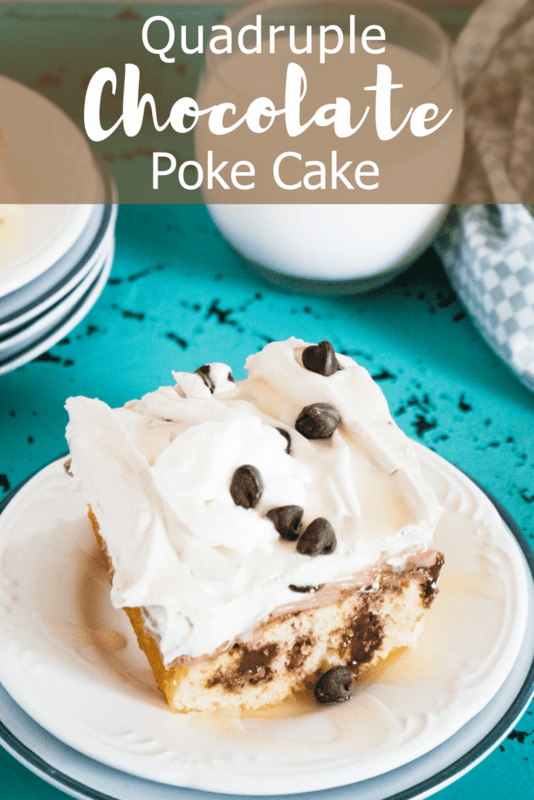 Poke cake is a real crowd-pleaser! Thanks to the poked holes that are filled with rich, delicious, chocolate filling, this Quadruple Chocolate Poke Cake recipe is moist and amazing, and one that everyone will love. Because even though this Quadruple Chocolate Poke Cake is chocolatey on multiple levels, it is not overpowering. It may be hard to imagine, but not everyone loves chocolate on top of chocolate on top of chocolate. That’s the beauty of this chocolate poke cake’s white cake base. It prevents it from being “too much” but instead makes it “just enough.” Even a moderate chocolate lover will rave over this dessert. The weather is finally getting warmer, so why not please the family with some deliciously fruity No Churn Strawberry Ice Cream? Trying to watch your weight, but really want a taste of summer fruit in a delicious cobbler? Try the Weight Watchers Peach Cobbler? Or, how about a taste of true Americana with this Apple Rhubarb Cake with Strawberries? • Bake cake in 13×9 pan according to package instructions. Allow to cool. • Using the end of a wooden spoon, poke holes in the top of the cake. • Make chocolate pudding mix. Pour chocolate pudding over the cake, making sure to pour over the holes. • Alternatively, put the pudding mixture into a plastic candy decorating bottle or icing bag and squeeze directly into the holes in the cake for more even distribution. • Next, cream together cream cheese and powdered sugar. Mix in the unsweetened chocolate and 2 tablespoons of milk. Spread evenly over the cake. 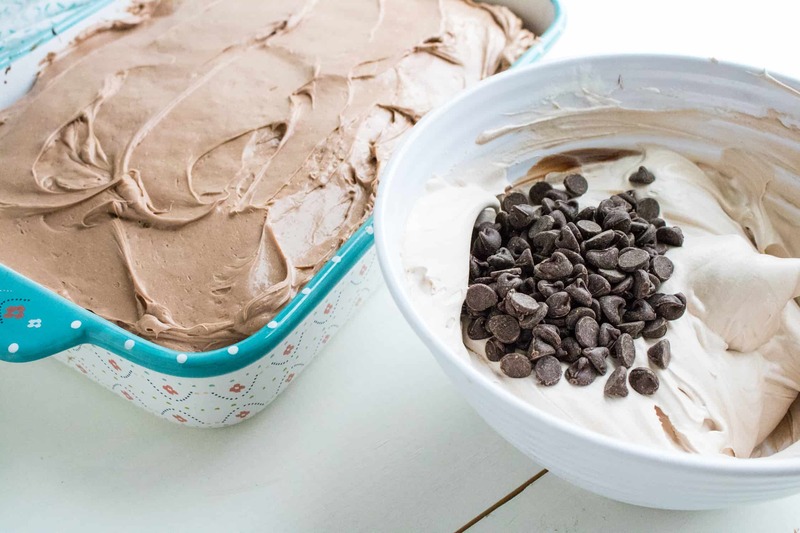 • Mix together whipped topping with 3 tablespoons chocolate syrup and ½ cup of chocolate chips. 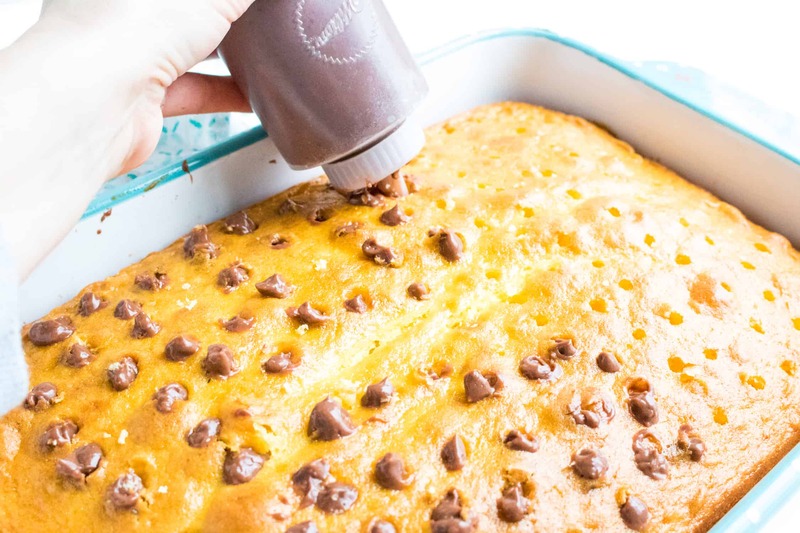 • Spread this over the top of the cake and then top with additional chocolate chips, if desired, and drizzle with white chocolate sauce. Chill for 4 hours before serving. 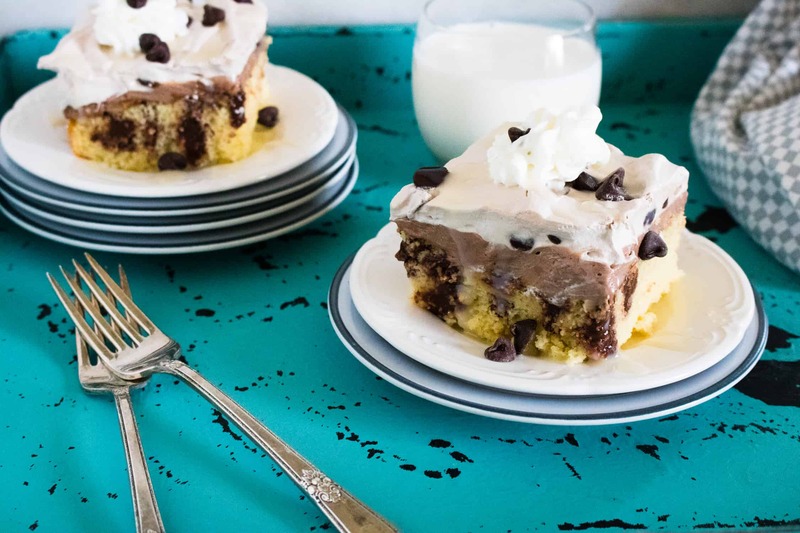 Rich and delicious Quadruple Chocolate Poke Cake is a chocolate lover's ideal dessert! Pour chocolate pudding over the cake, making sure to pour over the holes. Alternatively, put the pudding mixture into a plastic candy decorating bottle or icing bag and squeeze directly into the holes in the cake for more even distribution. Next, cream together cream cheese and powdered sugar. Mix in the unsweetened chocolate and 2 tablespoons of milk. Spread evenly over the cake. 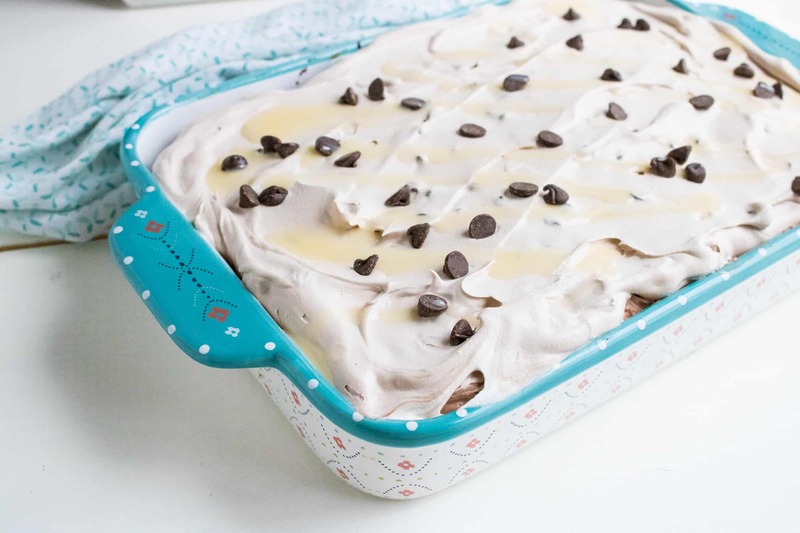 Mix together whipped topping with 3 tablespoons chocolate syrup and ½ cup of chocolate chips. Spread this over the top of the cake and then top with additional chocolate chips, if desired, and drizzle with white chocolate sauce.